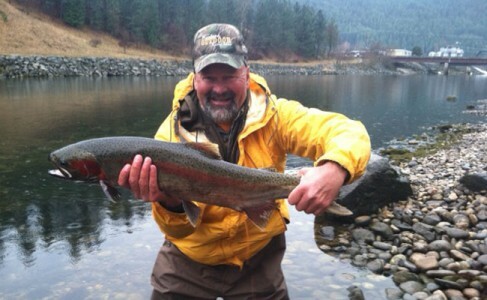 Steelhead angler effort and catch continued to shift upstream over the past week on the upper Salmon River. Angler effort in areas downstream of Salmon, ID dropped, while effort near the Pahsimeroi River confluence and upstream of Challis, ID increased. No angler interviews were obtained downstream of North Fork in location code 15, and no anglers interviewed upstream of North Fork in location code 16 reported catching a steelhead. Anglers interviewed upstream of the Lemhi River in location code 17 averaged 10 hours per steelhead caught and 17 hours per steelhead kept. Anglers interviewed upstream of the Pahsimeroi River in location code 18 averaged 26 hours per steelhead caught and 106 hours per steelhead kept. Anglers interviewed upstream of the East Fork Salmon River in location code 19 averaged 5 hours per steelhead caught and 19 hours per steelhead kept. The Salmon River is currently flowing at 1,550 cfs through the town of Salmon, ID which is 124% of average for today’s date. Upstream, near the Yankee Fork Salmon River confluence, the Salmon River is flowing at 741 cfs which is 137% of average for today’s date. River conditions were good throughout the weekend, with clear water in all areas upstream of the Lemhi River and river temperatures in the mid-40s. As of Sunday, April 1st the Pahsimeroi Hatchery had trapped 1,325 hatchery adult steelhead, and as of Monday, April 2nd the Sawtooth Hatchery had trapped approximately 250 hatchery adult steelhead.